This 3 bedroom lake house offers Lake Hamilton's main channel at your back door with this large, shaded lot and includes spectacular views of the lake from most rooms in the house! The home boasts a covered back patio, large deck down by the shoreline, and a personal boardwalk that is perfect for sunning, swimming, and fishing at the waters edge. A single-stall floating boat dock accompanied by year-round water allows for water fun for boaters or swimmers alike. A spacious kitchen with an island opens up to the main living area. The kitchen is well stocked with service for 10 people and includes various extra cooking/serving supplies. Around the corner you'll find a second living area complete with a tv and pullout sofa sleeper. Generous seating is included in both living areas, as are 2 TVs, DVD player, and Chromecast. Each living room walks out onto the patio. The house can comfortably sleep 10 people and bedrooms are located down the main hallway. The Master Bedroom offers a king size bed, Bedroom 2 has a queen size bed, Bedroom 3 has two sets of bunk beds, and the additional living area contains a memory foam queen sofa-sleeper. The home also includes two full bathrooms complete with towels. There is a large main entryway for lake gear such as coolers, fishing equipment, towels, and water toys. Boat/trailer storage is available on-site. Our patio is already equipped for you to sit back and relax outdoors with a charcoal barbecue grill, patio set, and dining table and chairs. Come enjoy our property as if it were your own! Husband and wife homeowners who are dedicated to making your experience at our vacation home the best it can be! If you have other friends or family you are trying to coordinate a vacation with on Lake Hamilton, also check out our latest vacation home that is located just a short boat ride away and available for rent (Home Away/VRBO listing #1563602). Located close to our main home, we loved the large yard, covered patio, and breathtaking lake views from both inside the house and down on the lower deck that this property has to offer. The yard leading to the lake is mostly shaded by large trees and the covered patio is perfect for hot and sunny summer days. The deck is uncovered but gets both sun and shade depending on the time of day. There is a fenced in yard near the driveway perfect for kids or pets to play while remaining contained. The floating boat dock is great for boating or fishing in the year-round water provided by the lake's main channel. TV in 2nd living area connected to DVD player. DVD library included in drawers under TV for your viewing pleasure. Walk-out onto covered patio from house. Newly-added large deck located down by shoreline. Amazing lake house near Hot Springs! Our family of 5 had an amazing stay on Lake Hamilton. The home was spotless and very well-maintained. Gorgeous yard with a wonderful lakeside deck - the pictures seriously didn’t do justice to the view. Owners were easy to communicate with. Kitchen was very well stocked. Plenty of space with this property. Would highly recommend if looking for a lakefront property near Hot Springs. Our group of 5 middle-aged women (58-73 yrs) had a great time at this property but be aware of the sharp drop to the lake! The nice open-format with a large granite counter was a perfect place to sit and chat, have meals, and play games. The bedrooms were nice-sized with just the necessities. All the beds were comfortable and the linens were cottony and fresh. Every room had a good ceiling fan. The bathrooms were very clean. The towels were cushy and felt newish, not worn-out and thin. Liquid soap for the sink was provided, but we would have liked soap for the showers. Also, no grab bars or shower mat for the very slick tub. The kitchen was well-appointed with plasticware of all kinds (tupperware! ), very nice wine glasses, nice sturdy dishes, and diverse cookware. Because we cook, we wished for more mixing bowls, foil (none), saran wrap (none), and salt/pepper (very little). Very nice Weber charcoal grill with chimney and grilling tools. The porch and outdoor furniture was lovely. We had one meal at the great 6-chair table out there. We agree with a prior review that the pictures posted do not clearly show the SHARP DROP between the house and the lake. There is a railing provided, but the paver steps going down do not provide a 100% reliable, safe path. Some were wobbly, covered by grass/algae, and not all level. IMHO for full-disclosure and clarity, the owner should post a picture from the lower deck looking up to the house so that you see this path and know what you're getting in to. I'm sure this may be less a big deal for younger groups, but it would have been nice to be more clear in advance. Overall a very nice house and a wonderful stay. Spacious home with a wonderful view of the lake. Family had a great time. Home had an inviting atmosphere with plenty of space. View of the lake was spectacular. It's a nice house and served it's purpose I guess. The pictures you see of the lake are VERY deceptive...it's a long ways DOWN to the lake, and at least a 40 degrees bank, steps are treacherous. And much farther coming back up. If you are over 60 and even a little out of shape...forget it, kids OK.
Access to the lake when you get down there? A ladder off the dock, steep and rocky other than that, water is very deep, if anyone can't swim ..stay away. The house is comfortable, well equipped with a nice view. 2 bathrooms and 10 people are a challenge, but you know that going in, one is accessed only thru the Master bedroom, which is at times [middle of the nite?] a little inconvenient. The 3rd bedroom is also pretty deceiving in the pictures, virtually no privacy, no door to close into the rest of the living area, and the outside entry [which is the main one] is directly into that bedroom. Don't think we'd rent it again, but if your real flexible it might be OK.
1. Pictures/Description: I'm sorry you feel the pictures/descriptions were deceptive; we make every effort to show how the property actually is. Many people have stayed and this is the first time we have heard this feedback. We listed pictures of the lake view from the upper patio (where you can see the lakefront hill), the lower deck (showing lower stairs to the dock), and other pictures of the yard/lake. We are sorry for the confusion and understand the property many not be for everyone. We do have a railing for the steps to assist people walking to/from the lake. 2. 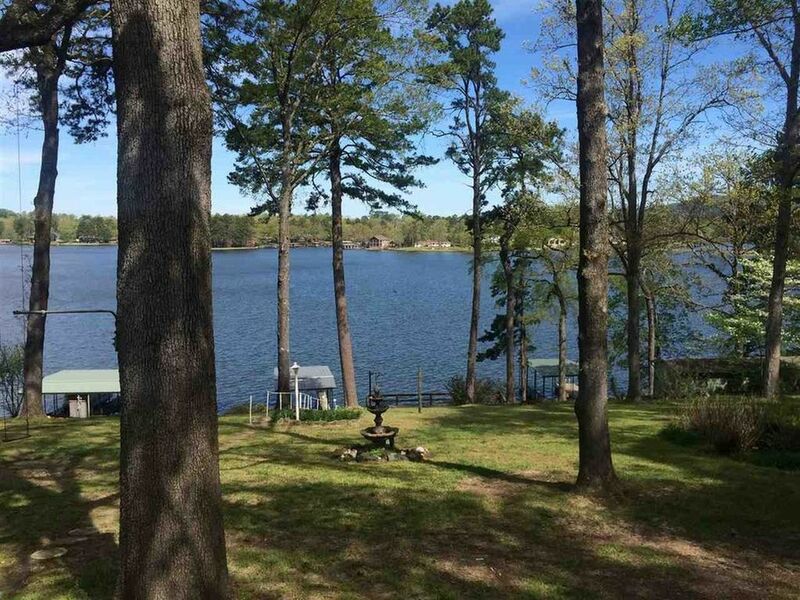 Lake/Swimming: Our listing name states that the property is on the "Main Channel" of Lake Hamilton, which typically means the lake water is deeper and not a gradual walk-in like you may find in the shallow coves of the lake. The dock's ladder has proven to work well for swimming near the dock for us and our prior guests (including young children who swim with life vests on). We do have a large lower deck and boardwalk down by the lake perfect for non-swimmers to enjoy close lake views, so we hope you were able to utlize those areas. 3. TV: In our listing we state that we have Chromecast - not cable - associated with both TVs, and we have clear instructions at the property on how to use it. We would have loved to help you with this if we knew you were having trouble. It is surprisingly easy when you are connected to the wifi with a smartphone, tablet, or computer. 4. 3rd bedroom: We do have 3 full bedrooms (king room, queen room, and room with 2 sets of bunk beds) and each room has a closed door. The "3rd Bedroom" I think you are referring to is the front living area, which we do not advertise as a bedroom but another living area with a pull out couch for two people to sleep. We have plans to add a door between the front living area and the kitchen some time in the near future. We do not market this room as a bedroom - as it is not one. 5. Master Bathroom: In the amenities area we advertise the second full bathroom to be the master bath, which means you have to enter the Master bedroom to use it. I apologize if you were confused by this language. We always strive to meet guests' expectations and welcome guests to reach out to us at anytime with questions/concerns prior to or during their stay. We will always respond within 24 hours and likely within an hour or two. After we arrived home, we had an email notification that we would not receive our deposit back due to excessive smoke smell in the rental property and that we had left the rental home after the check-out time. I would not blame the owners if this were true. We have no smokers in our family at all, so it is impossible to have left the house with a smoke smell. We left the house at 10:15 a.m. sharp and check out is at 11:00 a.m. There are cameras, so an explanation may be that the camera time settings had not been changed for Daylight Savings, just a thought. There may be explanations for why the owners believe these two things, but I have no contact information to be able to discuss with the owners. I am highly disappointed in the false accusations and the deposit not being returned. 1) Lake Check Out: We NEVER stated anywhere that we withheld deposit money due to checking out late. In fact, this was the initial message to you "Our cleaning service reported that the house had been smoked in. Our policy and agreement stated that there was no smoking in the house. We had to extra cleaning and it hurt the next guest experience so we will be withholding $150.00 for your deposit. Please let me know if you have any questions about this." I am unsure where and I would be interested to know how you thought by this message or any subsequent messages withholding deposit money had to do with checking out late. 2) Smoking/Unresponsiveness: When you responded "as to my knowledge nobody smokes in my party" and asked for the cleaning service's accusation, within 2 hours I responded back to you relaying exactly what my cleaning service told me. I also specifically asked you to follow up by asking the following questions: "Is there anything else it could have been that she smelled when she arrived? Was anyone in your party smoking outside or anything that could have followed them in the house?" I would have been willing to drop the charge or negotiate a little with you if there was some sort of other explanation but I DID NOT hear back from you again. You also have our phone number from the rental agreement you signed, but did not try to further remedy the situation via phone call either. I think it is unfair and outright untrue to say that you have "no contact information to be able to discuss with the owners" when you have our number and can also easily communicate through VRBO messaging, through which we had been very responsive. We have never withheld a deposit from anyone but chose to for you because the house had clearly been smoked in. I pride myself with being fair, clear, and responsive to customers, so it is very unfortunate that you did not feel this is the way you were treated. Watercraft Rental: We are only a 9 minute drive and short boat ride away from both the Salty Dog Boat & Jet Ski and Kahuna Bay Boat and Jet Ski rentals. We are a 13 minute drive from the Hot Springs Marina.